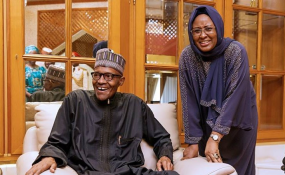 President Muhammadu Buhari and wife Aisha Buhari. She said: "The strategy vision behind the engagement of the office of the wife of the president is to contribute to the acceleration of efforts to end preventable maternal, newborn and child death through advocacy and strengthening of accountability mechanism in order to maintain the peace and development of Nigeria. "The steady advancement of women in contributing to the country's social-economic development and their progressive prominence in the national scheme of affairs has in a large extent impacted on the Federal Government and the government has responded positively in many ways. "The Future Assured Programme of Aisha Buhari Foundation shares the same vision with Tony Elumelu Foundation to emphasise true intervention in health, education and economic development. "It is worthy to note that there has been a progressive increase in female participation in the Tony Elumelu Entrepreneurship Programme over the years, with a 41.6 per cent female representation in 2019. I wish the cabinet will have the same percentage. "Women have continued to prove their strength and competence in our society in all spheres, even in male-dominated -- not in politics. "We will like to take this opportunity to encourage Nigerian women, especially from the north, to apply for the Tony Elumelu Entrepreneurship Programme."